"Four years Bon Jovi Web Radio ...and we still keep the faith"
Powered by hackaday. Copyright 2011 ©. All rights reserved. 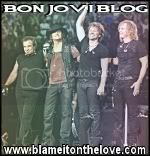 We are not affiliated with Bon Jovi, their company or their management.